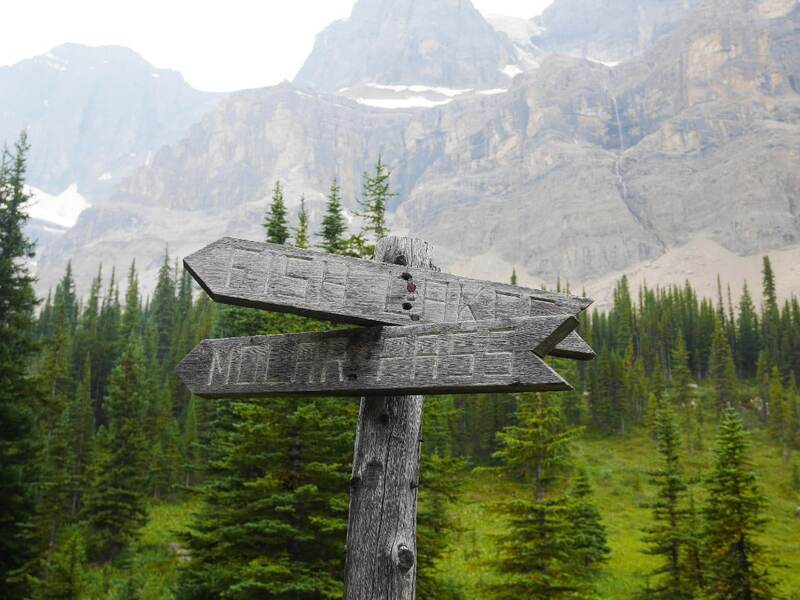 The hiking trail to North Molar Pass takes you to one of the most amazing, vast alpine meadows in Banff National Park. This long day hike has ample rewards for strong hikers. 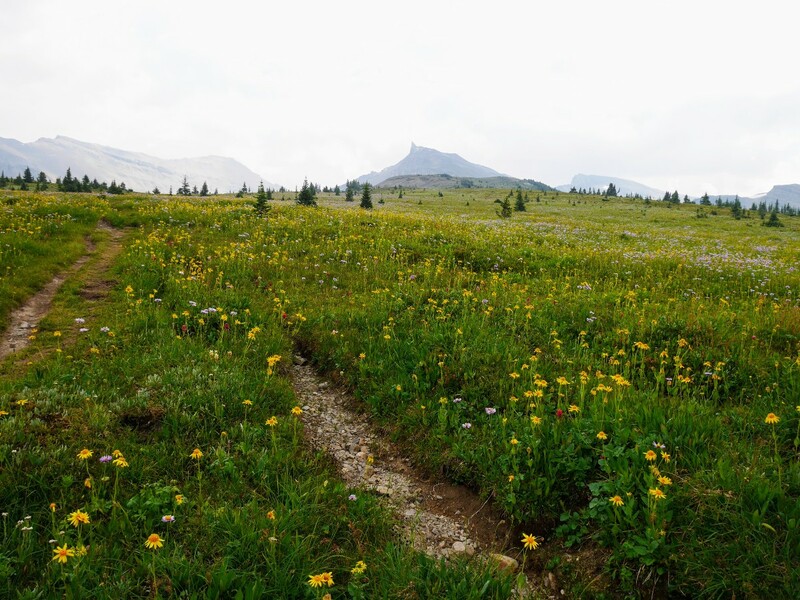 Add the North Molar Pass hike to your bucket-list! From Banff, take Trans-Canada Hwy west. Go north on Icefields Parkway (93N) after 55.0km. Drive 24.0km and turn into the Mosquito Creek campground. Park on the driveway of the campground. Cross the Hwy. Go to the banks of Mosquito Creek. You’ll find a trail information stand. 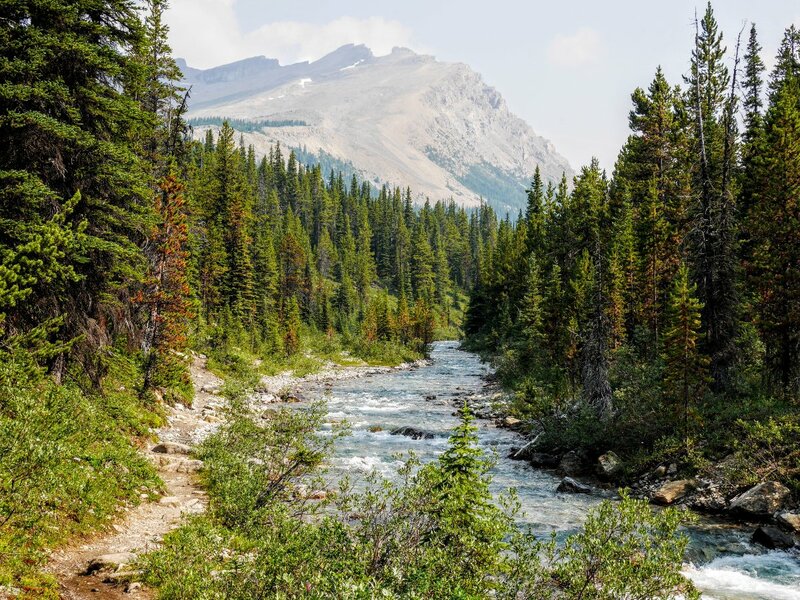 The North Molar Pass trail climbs steeply up the banks of Mosquito Creek for a few hundred meters, before levelling out in an open coniferous forest. Shortly after that you’ll pass a long clearing with a view to Dolomite Peak in the distance. 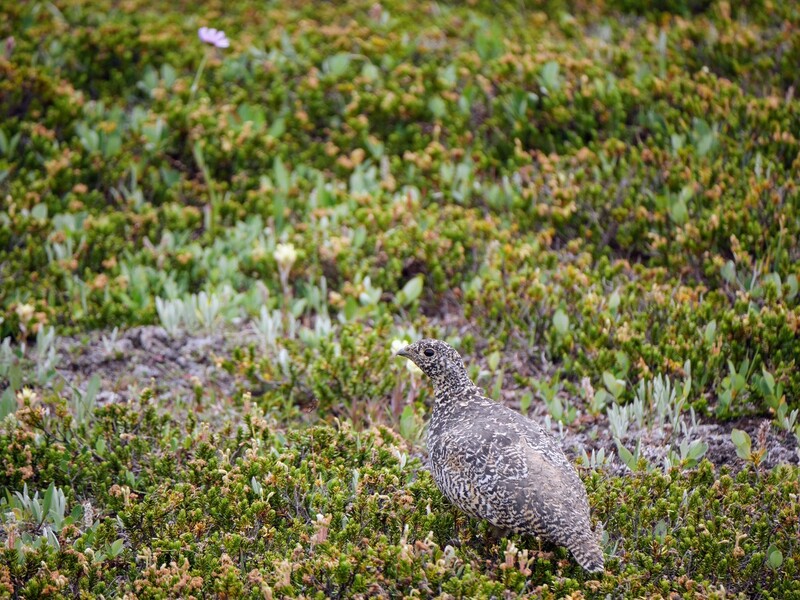 This clearing is a relic of the “Wonder Road,” a precursor to the Icefields Parkway. You’ll hike parallel to Mosquito Creek for the first 1.9km. The forest here is open enough for a few wildflowers to grow: twinflower, yellow columbine, and white camas. A few side trails can take you to the steep banks for a view, but soon you’ll drop down to creek level into open valley bottom. To the right are the cliffs of Noseeum Mountain, to the left the flank of Dolomite Peak. Work your way across alluvial fans and avalanche paths amongst willows and the odd pine. The rocky soil and cold air brought in by the creek makes the growing season short here. On our last hike the trail had been rebuilt in places, however it may shift again due to avalanches and heavy snowmelt. In more than one place, the creek is beginning to eat away at the trail. 5.0km in, amongst a boulder field, lies the Mosquito Creek backcountry campground. Picnic tables by the water make for a great snack stop, but beware: those hiking in July & August will have to fight off horseflies. We like to do this hike with light trousers and a light long-sleeve top to limit bites! Cross the creek again and work your way gently uphill on a braided trail through mixed forest and meadow. This trail is used by horse trips – hence the braiding – and can be extremely muddy in wet weather. The forest opens up and you’ll walk along a narrower valley under the northeast face of Noseeum Mountain. 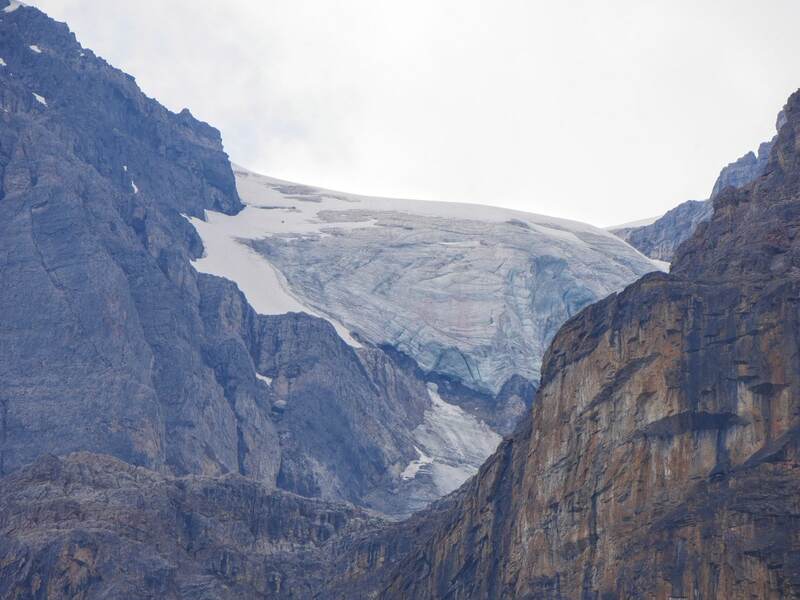 Watch for thin waterfalls cascading down from the perennial snowpack at the top, and the short, thick chunk of ice that makes up Molar Glacier. 2.5km past the campground, you’ll arrive at a junction with a classic wooden sign. To the right is the trail to Molar Pass. Taking this fork will save you 2.9km and 220m of elevation gain – a good option if you started your hike late in the day; however, we prefer the longer route to North Molar Pass, which we will cover. Taking the left fork for North Molar Pass, you’ll continue straight as you ascend steeply through the trees for 1.0km. This section of the trail is a loose, braided, rocky mess, and it turns to a watercourse during rainy weather. 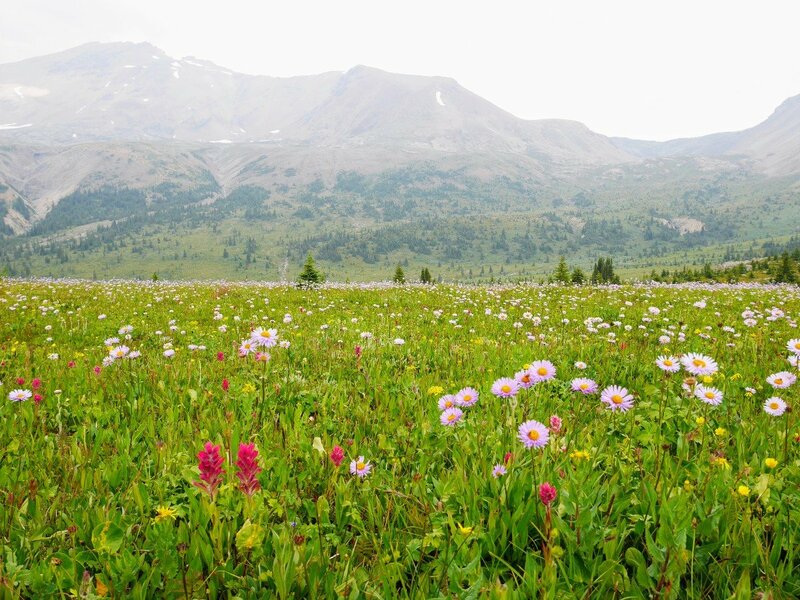 But, all of that will be forgotten when you arrive into one of the biggest alpine wildflower meadows in Banff National Park, best viewed most years in late July or early August. The next kilometre is a gentle ascent through a rolling carpet of vibrant flowers that you’ll never want to end. Cotton grass, Indian paintbrush, arnica, golden fleabane, Lyall’s goldenweed, saxifrage, aster, snow buttercup, and western anemone create an explosion of colour, best viewed in late July/early August. The castellated towers of Dolomite Mountain dominate the view to the west, while the knifelike west ridge of Molar Mountain runs along the east edge of the meadow. The trail comes alongside Mosquito Creek again and shortly arrives at the shallow Mosquito Lake. It’s a lovely spot for lunch, and a fine end-point for those who’d rather relax and enjoy the wildflowers than slog up to the pass. Watch for a rock cairn marking where you cross the outlet stream of Mosquito Lake. Trails extend past here towards the east side of the lake, but peter out and serve only to confuse. The trail ascends to a small bench behind the lake, and the vegetation becomes drier and tundra-like. 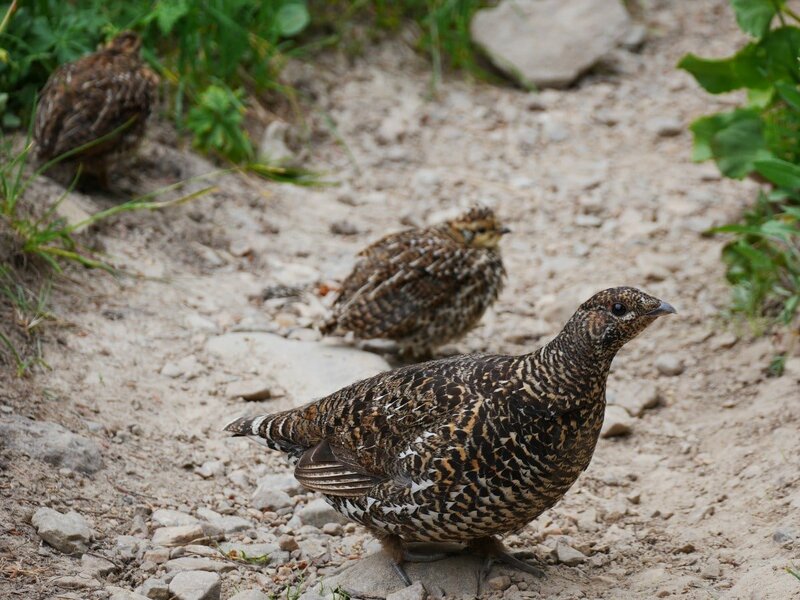 Watch out for white tailed ptarmigans, golden-mantled ground squirrels, and marmots here. Hop across a small stream and begin the steep final ascent to North Molar Pass. The trail switchbacks through pale pinkish-orange scree and dark grey limestone. Snow lingers late here – we crossed several patches when hiking in August. Just before you reach the pass, a distant peak towers above the surrounding ridges: the summit of Molar Mountain. The rocky notch of North Molar Pass is sharp and narrow, the terrain dropping steeply away on each side. 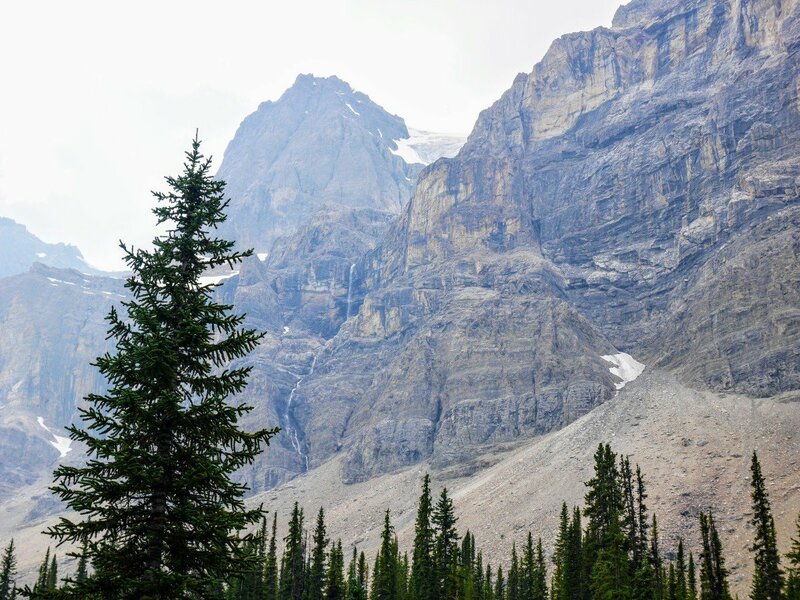 At 2590m, this is one of the highest trail-accessible points in Banff National Park. On the east side, the Fish Lakes valley beckons invitingly, although descending this route will add another 6.0km and 365m of elevation to return to your car. Enjoy your time at the pass, but remember to allow 2-3h for the return trip (same route you followed in) on this long day hike. Laggan’s Bakery in Lake Louise is a great spot to pick up sandwiches and their famous health cookies to take along on your hike. They open early, at 7 a.m. in summer, so you can hit the trail with plenty of time to complete it. The HI Mosquito Creek provides rustic dorm style accommodation minutes from the trailhead, and includes a wood fired sauna to ease those aching muscles after hiking 24.0km! Make a quick stop at Herbert Lake on the way to the trailhead. Herbert Lake is a popular swimming hole for locals. The lake creates incredible reflections during the calm, early morning.